The lion city or the jaw-dropping garden city (although Singapore is trying to make a transition from “the Garden City” to “the City in the Garden”). A longer stopover for my holiday to Borneo that I wish lasted a bit longer than it had. The city-state is spectacular and rich (maybe it is spectacular because it’s rich?)! The way the founding fathers used the location and climate to create this amazing place to live and work is worth praising. Although it’s not all whistles and flowers. The country government is very intrusive and the law is aimed at punishing crimes heavily. Spitting, smoking, littering, chewing gums, feeding birds you name it, it all can set you back by 1000$. But then again the city is extremely clean and people so well mannered…. Give up some freedom but live in a peaceful and clean environment. Swings and roundabouts I guess… but as a visitor I have to say it was pretty impressive! There is an abundance of airlines flying into Singapore including a 5* Singapore Airline. Not on the cheap side but when you think of a world class service to a world class Airport (Changi is one of the best if not the best airport in the World) then that’s a pretty decent start to any holiday. Of course there are cheaper alternatives like Norwegian Air which I can wholeheartedly recommend. Affordable, reliable and flying a new set of Dreamliners, Norwegian is a very good budget option. They are considered a budget long haul carrier and the budget part means you pay for the flight only and in-flight meals and check in bags are optional (and quite frankly not that cheap). It’s more like a bus ride. Travelling light has never been this rewarding! So to speak. Shall we go? Norwegian Airlines are flying to Singapore directly from London Gatwick airport and it is a bit of a trip to get there unless you get a (sort of) expensive train. Then it’s fast and reliable and takes 30 minutes compared to 2h by National Express bus service (from London Victoria). Missing a flight can be a nightmare so yes, I recommend the train. Gatwick from above. It had a chance to become a biggest monster-airport but it has recently been announced that Heathrow Airport will get a new runaway on the expense of Gatwick extension, so the chances for Gatwick to expand are now rather slim. I did not take too many pics from the plane this time. It was a night flight so barely anything could be seen outside. We did fly over India and believe it or not, we passed Taj Mahal (saw it on the screen). It was too dark to see it though so I had to use my imagination… sigh. Had it been a day I would have most certainly spotted it! So if you are flying on this route keep your eyes open. Anyway, here we are in Singapore. And the first thing I see is… Orchids. Such a lovely view. And there will be more, so much more! Singapore is a city-state and a truly Global City and you can tell it the minute you leave the train station in the city (the airport is well linked to the city centre). Similarly to Japan, the train was insanely quiet. By quiet I mean no one was talking to anyone. It was a fairly busy service as you would expect in the morning during a weekday, but the silence was rather disturbing! Cultural differences I guess. My eyes and ears were not wide open anyway. I love the small architecture that’s clever and bold at the same time. Well done! The below is a one kick-a** hotel that I managed to spend a night at. Park Royal Hotel is what modern cities desperately need. 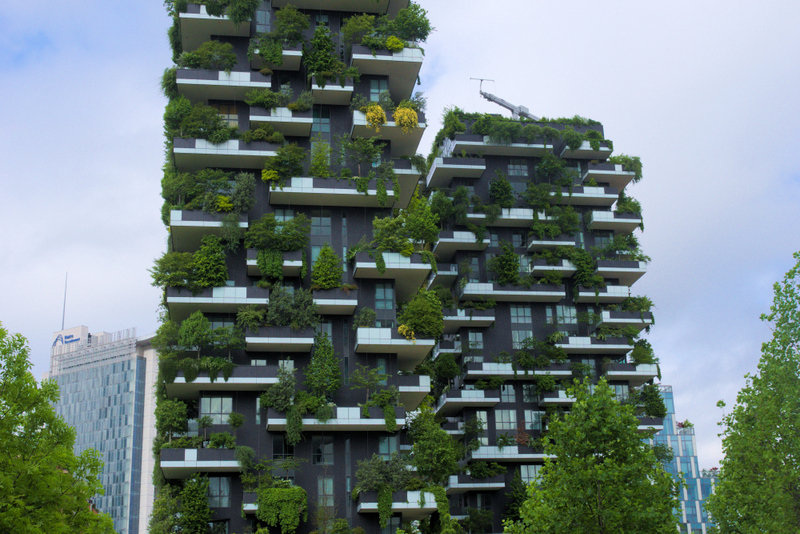 Vertical gardens taken to the next level (there is a similar project in Milan). Of course the climate must be moderate enough to accommodate this kind of set up so northern cities have it a bit more difficult. But then again if there is a way to plant trees on skyscrapers, just do it! What an astonishing and eco-friendly project. Thank you Singapore. Food. I do not have to mention how good it is in Asia. You do not know what you are ordering (unless you know Chinese) but the chances are it’s gonna be tasty (as it was in my case). Singapore is a safe place to eat out but I have heard many stories of people suffering badly after eating out in less developed countries like Vietnam or Cambodia, so just be careful. Especially street food tends to be “dangerous”. Always have some pills to help with diarrhea. The streets back in the days were full of eco-friendly rickshaws. Although I think there are better eco-ways in our times. The city is very business oriented and you can clearly see it when walking around in the morning. One of the official state languages is English so there was no problem with communication whatsoever. The waterfront is probably the most iconic one with quite a few remarkable buildings including Marina Bay Sands (you must have seen the huge rooftop swimming pool?). Unfortunately the access to the pool is for guests only. Paying £400 for a swim was unfortunately not what I had planned on doing on this holiday so… maybe next time? Or next life I should say? The famous Marina Bay Sands. A multi-billion $ project. Where if not in Singapore? Can’t see the swimming pool but it’s up there along that huge bridge. We are entering the most amazing man-made complex/project I have ever seen. The city must have made a vow to nature and it’s a pretty happy relationship. I do understand it’s again the tropical climate that allows for a year-round gardens to flourish but it’s also the idea(s) and execution of it. So, Gardens by the Bay. What is it exactly? Gardens by the Bay complex, as you can see below, is located right behind Marina Bay Sands and the waterfront. It is a nature park covering 110 hectares of reclaimed land and divided into 3 sections: Bay Central Garden, Bay East Garden and Bay South Garden where the main attractions are located. It is a bit sci-fi and Avatar like. That’s what I love about it! Tourists must be feeding them poor creatures as they float as the sight of my hand! My first South-East Asian animal encounter (not counting birds). Quite unique I would say. This little reptile was not afraid of my camera at all. Bless him! And he put up quite a show too! Mariuna Bay Sands from the garden side. You can clearly see the trees up at the top. The glass dome in the background is where I was heading. It’s an indoor botanic garden split into two sections: Flower Dome and Cloud Forest. Both spectacular! Aaaaand up on the trees! This is quite a walk and for those afraid of heights this might not be the best way to see the city. It is a bit high-up and the floor is see-through so… be careful. I was a bit worried myself but the desire to take pictures from above was much stronger! Another tasty mean in a nearby restaurant. Let’s move to the higher dome called Cloud Forest. This one is more breathtaking as it boost an indoor waterfall which you can walk around admiring various rainforest plants. Back outside. The weather has changed into a proper tropical cloudy-rainy but still warm and humid. It is warm enough to sleep on the streets. Or at least take some naps! Singapore’s main leverage was it’s location. The city became a gateway to Asia by building container terminals. Thousands of cranes speak for themselves. Time to leave Singapore for now. But I will be back!